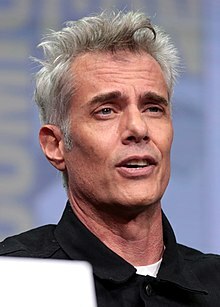 Dana Vernon Ashbrook (born May 24, 1967) is an American actor, best known for playing Bobby Briggs on the cult TV series Twin Peaks (1990–1991, 2017) and its 1992 prequel film Twin Peaks: Fire Walk with Me. Ashbrook was born in San Diego, California; his mother, D'Ann (née Paton) is a teacher and his father, Vernon L. ('Buddy') Ashbrook, was a director of the Palomar College drama department. He is the brother of writer Taylor Ashbrook and actress Daphne Ashbrook. In 1978, Ashbrook made his film debut in an uncredited role in Attack of the Killer Tomatoes!. A decade later, after an acting hiatus, Ashbrook guest starred on the television series Cagney & Lacey, Knots Landing, and ABC Afterschool Special before starring as Tom Essex in the 1988 horror film Return of the Living Dead Part II. The same year, he starred in the horror film Waxwork alongside Deborah Foreman and guest starred on an episode of 21 Jump Street. Ashbrook arriving at the 43rd Primetime Emmy Awards in August 1991. In 1989, Ashbrook portrayed Joey in She's Out of Control. From 1990-1991, Ashbrook was cast as Bobby Briggs on the cult TV series Twin Peaks. While starring on Twin Peaks, Ashbrook starred in the films Sundown: The Vampire in Retreat (1990), Ghost Dad (1990), Girlfriend from Hell (1990), and The Willies (1990) as well as guest starring on an episode of the television series The Hidden Room. In 1992, Ashbrook reprised his role as Bobby Briggs in the prequel film Twin Peaks: Fire Walk with Me and portrayed Clyde Barrow in the television film, Bonnie & Clyde: The True Story alongside Tracey Needham. In 1994, Ashbrook starred alongside Jennifer Rubin and Quentin Tarantino in the short film The Coriolis Effect. The same year, he starred in the film Cityscrapes: Los Angeles He starred in the 1995 science fiction television pilot W.E.I.R.D. World, written and produced by the makers of the Tales from the Crypt series. In 1995, Ashbrook starred in the film Comfortably Numb. In 1996, Ashbrook guest starred on the television series The Outer Limits. The following year, Ashbrook was cast as Gary McDermott on the short-lived television series Crisis Center. In 1998, he portrayed Seth in the film Interstate 5 and guest starred on the television series Welcome to Paradox. Ashbrook has appeared on The WB's Charmed in the 2001 episode "Just Harried", on NBC's The Pretender in the 2000 episode "Rules of Engagement", on The Outer Limits in the 1996 episode "Resurrection", and on Law & Order: Special Victims Unit in the 2007 episode "Haystack". Ashbook played the recurring role of Rich Rinaldi on the television series Dawson's Creek (2002–2003). In 2009, Ashbrook joined the cast of the series Crash for the regular part of Jimmy. In 2010, he reunited with some of the cast of Twin Peaks on the comedy-tribute episode of Psych, titled Dual Spires. In 2012, Ashbrook starred alongside Ray Wise and Derek Mears in the Steven C. Miller psycho-thriller The Aggression Scale. In 2014, he was cast in the werewolf horror film Late Phases. The same year, deleted footage that he filmed for Fire Walk With Me was used for David Lynch's film Twin Peaks: The Missing Pieces. In 2017, Ashbrook reprised his role as Bobby Briggs in David Lynch's revival series Twin Peaks: The Return. Ashbrook married actress Kate Rogal on August 15, 2015 in a private ceremony in Pittsburgh, Pennsylvania. 1986 Cagney & Lacey Kevin Slade Episode: "Capitalism"
1987 ABC Afterschool Special Brian Episode: "Just a Regular Kid: An AIDS Story"
1988 21 Jump Street Mark Stevens Episode: "Whose Choice Is It Anyway?" 1991 The Hidden Room Matt Episode: "Taking Back the Night"
1996 The Outer Limits Cain Episode: "Resurrection"
1998 Welcome to Paradox Marshal Stu Clemens Episode: "Into the Shop"
2000 The Pretender Cam Larsen Episode: "Rules of Engagement"
2001 Jack & Jill Frank Episode: "What Weddings Do to People"
2001 Charmed T.J. Episode: "Just Harried"
2004 The Division Carl Episode: "It's the Real Thing"
2006 Deadwood Hearst Goon Episode: "Tell Him Something Pretty"
2007 Law & Order: Special Victims Unit Paddy Kendall Episode: "Haystack"
2011 White Collar Thomas Carlisle Episode: "Scott Free"
2013 Blue Bloods Tommy Banks Episode: "Ends and Means"
2017 Rosewood Jeff Groves Episode: "Calliphoridae & Country Roads"
2017 Chicago P.D. Mark Scalise Episode: "Grasping for Salvation"
2018 The Resident Kevin Fell Episode: "Run, Doctor, Run"
^ a b c "Dana Ashbrook Biography". The New York Times. ^ "Dana Ashbrook Filmography". The New York Times. This page was last edited on 19 February 2019, at 18:42 (UTC).